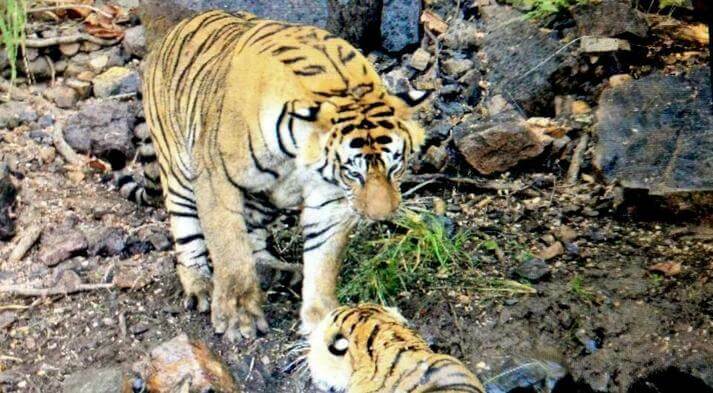 The year had just begun when an uneventful raging scene took place in Rajasthan's Ranthambore National Park. As per the media reports the clash between the two tigers took place near the Bakola area when T-74 attempted to mate with T-41. The tiger T-74's effort to maneuver T-41 went in vain as the female tiger refused which ultimately drove to a furious claw fight between the two tigers. The tiger T-74 'Teddy Bear' is the son of T-17 'Sundari' who is the daughter of the Tiger T-41 is a mother of a six-month-old cub and this could have been a reason why she acted violently when T-74 'Teddy Bear' approached her. The fight trying to outmaneuver lasted for few minutes eventually ending with a tie with neither of the two gaining success. The tigress T-41 was seen lying in the water for a long time after the fight. The tiger T-74 'Teddy Bear' is the son of T-17 'Sundari' who is the daughter of the most photographed tiger in Ranthambore National Park 'Machhli'. Hence, the grandson of 'Machhli' takes the lineage as he was seen ruling certain areas in the park. He is also said to have driven away T-25 'Dollar', the former partner of T-41 and the father of a 6-month-old cub. The T-74 was also seen with T-19 'Shy Ruler' before approaching T-41 on Friday the 6th. According to the 2015 tiger census, the Ranthambore National Park has more male dominance than female and hence, there are many clashes amongst the genders of the tiger in the reserve.